A group of the brightest minds at the Virginia Commonwealth University School of Business got an early look into one of the biggest economic development projects in Richmond in decades: Stone Brewing Co.’s East Coast production and distribution facility in the Greater Fulton community. Eyeing future careers in business strategy and finance, the students tossed out questions about the business strategy, use of bonds, and of course the beer-brewing process to leaders at both Stone Brewing Co. and Hourigan, which fast-tracked the 213,000-square-foot facility to suit the brewer’s needs in only 14 months. The building was completed in February and its store and taproom opened late that month. Stone is expected to begin test brewing at the end of April. The tour opened with an introduction to the facility from Juliellen Sarver, Stone community relations manager and resident of Greater Fulton, who provided the history of the city landing Stone Brewing Co., a contract that was announced in late 2014. Stone, as she and many others have noted, has been a shot in the arm for a community with a median household income of $17,000. Fulton has no bank, no grocery store, no pharmacy or other key community needs, she notes, but with Stone, that’s likely to change in coming years. “Stone came here with reason, and that reason was to grow a community,” Hourigan client solutions manager Michael Henley told the assembled group of VCU students. The facility is expected to create more than 200 jobs, Sarver noted, and is already drumming up economic development studies and further interest in growth in the area. Henley and Sarver fielded questions from students ranging from the strategies behind the construction of the facility (built to suit the needs of Stone, which made tenant improvements and will lease the facility for 25 years with the option to purchase), the $60 million worth of equipment inside it (owned by Stone), to the piping throughout the massive facility. 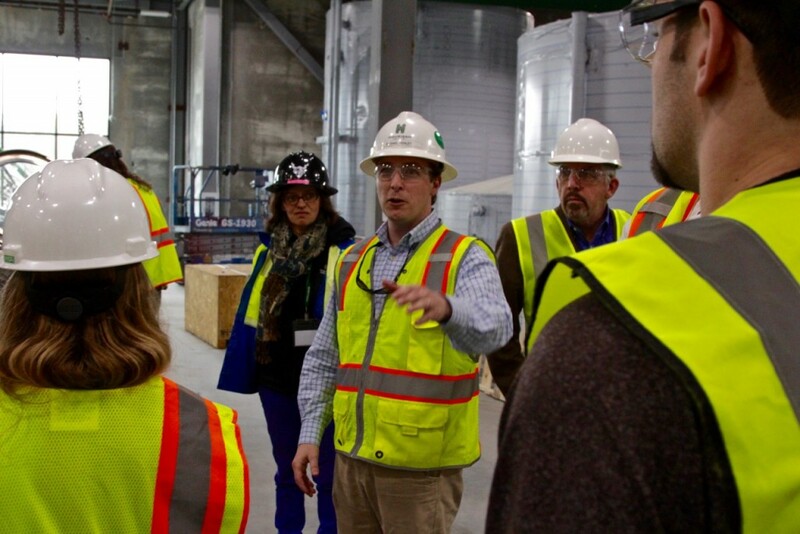 As construction manager, Hourigan also worked closely with Stone’s own engineers to build a facility that could grow over time and fill craft beer demand for decades to come. Stone will ship its brews up and down the east coast, Canada, and as far west as the Rocky Mountains through this Richmond based facility. Hourigan is a regional construction company based in Richmond, Virginia, that is both active in the community and a strong supporter of Virginia universities. and the technical requirements to create a complex industrial and process engineering facility. Through Hourigan’s relationship with VCU School of Business professor Bob Kelley, the event was a perfect opportunity to showcase a high-profile project, and a business, Stone Brewing Co., which experienced 78 percent growth in 2013 before deciding to open a new facility. “Our approach to education is that we must not only build facilities that create incredible learning environments for students, but also get the people of Hourigan out into the world and get hands-on with the leaders of tomorrow,” said Mark Hourigan, president of Hourigan Construction, which actively recruits engineering and construction students from many of the great universities in the state and other regional schools.